He came to talk about the situation in Donbas and sanctions on Russia. Ukrainian President Petro Poroshenko met Slovenian President Borut Pahor who came to Kyiv on 12 February after visiting Berlin and Moscow. They discussed the situation in Donbas and sanctions on Russia. The Ukrainian president's press service said that Poroshenko briefed Pahor on the recent escalation in Donbas after the massive shelling of Avdiyivka by the Russian occupation troops. He said that any progress in peaceful settlement would require a full ceasefire and the withdrawal of heavy guns. Poroshenko pointed out that it was important for the EU to remain consistent with regard to sanctions on Russia until Ukraine's sovereignty and territorial integrity are restored, and that applies to Crimea too. 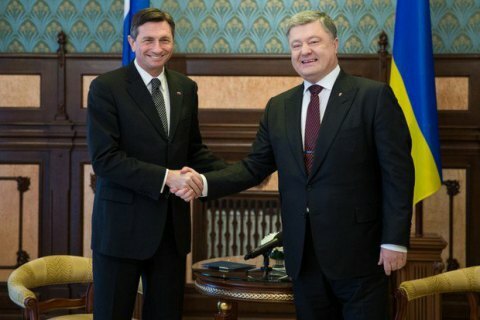 Pahor, for his part, briefed Poroshenko on the results of his talks in Moscow and Berlin. The two presidents discussed the issues of visa liberalization, cooperation in energy efficiency, air link between Ljubljana and Kyiv. Poroshenko said he was looking forward to Pahor coming to Ukraine on an official visit next time. On 8 February, Pahor met German Chancellor Angela Merkel in Berlin. Two days later he visited Russian President Vladimir Putin in Moscow.